We all talk about trying to get healthy, but most of us fail at the attempt. We think we know what we have to do, but we don’t seem to get it done. Maybe we don’t know how we just think we do. The way we use to lose weight in our younger days isn’t going to be the same and that’s why most of us fail. The best way would be to totally start over. Start living your life like your young again. Start by changing your diet. Be careful what you’re buying at the store. If you remember to eat fresh, that’s the best way to remember what to buy. Cut out everything else. Lean meats and fish, half the meat should be fish. Easy on the dairy, no processed cheese, greek yogurt is okay. I like coconut milk or almond milk it has less fats and more calcium. Dairy can put on a lot of weight. Fruits and vegetables, nuts, dates and figs are all good. I like the diet of the Mediterranean people. There’s no calories to count. You make up your menu from the food pyramid. 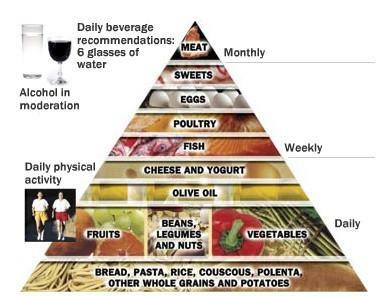 If you follow the pyramid you see that the bottom group of food you can eat every day, the middle section you can eat from once a week and the very top is meat (beef or pork) and only eat once a month. You can eat all you want but stick to the pyramid and don’t cheat. Physical activity is important everyday. and drink lots of water. You can have one glass of red wine with dinner. This is not a quick weight loss plan, but you will become a healthier person and you will lose weight slowly. The more physical activity like walking the faster you’ll lose weight. Okay, this is step one to living longer. First of all, that’s not true. Anyone can do Yoga. There are poses for people of all sizes and all ages. Some seniors like to use a stationary bike. It’s simple to use and you will build up strength in your legs, work the joints in your feet, ankles, knees and hips. If it hurts at first, it’s because you’re not use to working those muscles. Start out slow for 10 minutes and add a few minutes a day and soon you’ll be walking around the block or walking through the mall like those young people. Retirement homes are teaching physical education and teaching seniors how to exercise. It’s never too late for anybody. Step three for living longer is to keep your mind sharp. I know that this might seem crazy, but watching TV doesn’t stimulate your brain, it puts it to sleep. When you have leisure time you want to read. Do puzzles or learn a new language. I took a class at a community college a couple of years ago and I couldn’t believe all the seniors going to school. They take classes in everything. I want to take another class next semester, but you have to sign up early or the good ones are gone. I’ve been trying to get into a creative writing class for a couple of years, but the hours I want are always filled. Writing is something else to do to stay active. Most people don’t know where to start, so I tell them to start anywhere. You don’t have to write a book, just write. Write about the last vacation you took or about your life growing up. You might not think that anyone is interested but now that I’m 60 something I wish I would have asked my grandparents and my parents more about their live. You can put your life on paper now, even if no one is asking. Generations from now they’ll want to know and you might not be here. Those are the three steps to living longer and living healthier. Sometimes be spend too much time taking care of or worrying about other people and we don’t think about how important it is to take care of ourselves. This entry was posted in being healthy, diet, eating healthy, health and fitness, lose fat, losing weight, Uncategorized and tagged being healthy, diet, health and fitness, losing weight. Bookmark the permalink.